In a standard fit of, I don’t want to study and I already got into college, I made dinner. 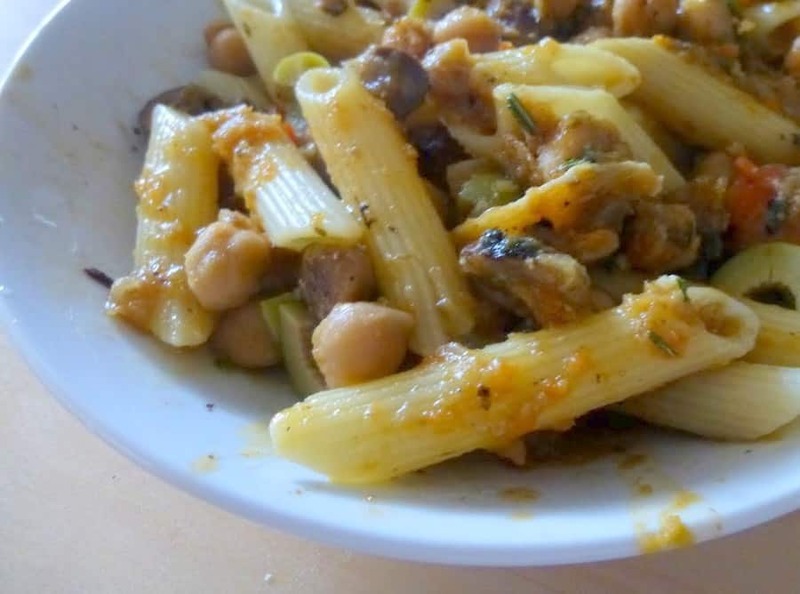 This week’s edition: garlic and rosemary infused penne with chickpeas. I only added a pinch of red pepper flakes in the first part of the sauce, since I don’t like things too spicy. You can always add more, rather than take some away later. I didn’t want to pull out the blender, so I used the Magic Bullet. However, it didn’t want to cooperate and chop up everything nicely. I added some water to help things along, but things got very… frothy. Like a smoothie. Whoops. I do have to say that celery foam is the most gorgeous shade of pale green. Anyways, so I left about half of the veggies chunky and the other half foamy and light colored. Also, I don’t care for parsley, so I threw in some dried basil instead. I doubled all the vegetables, since I happen to like vegetables a heck of a lot more than meat; this guideline to my love is completely discarded when Spam (pan-fried, please), bacon (maple-roasted, please), or hamburger (any way, please) is involved. I sauteed off one of the onions with a carton of mushrooms before adding the baby food other “chopped” vegetables. The onions were sauteeing so nicely; I cranked up the heat to medium-high, and I was so proud of the developing fond. I walked into the other room to continue typing this, my mind humming at the prospect of perfectly burnished mushrooms. However, there’s a time when the Maillard reaction turns into something else, when charred downgrades into burnt. I smelled the later two minutes after moving away from the kitchen. I opened the lid to find a nice black crust, swearing in my head. Let me tell you, there are better ways to spend a Saturday afternoon than picking off ashy bits from your previously gorgeous mushroom and onion saute. In non-burnt news, I didn’t feel like going out to buy tomato paste, so I added the mushrooms along with some soy sauce and fish sauce in hopes that they would add more umami. I used a bit of ketchup to get that acidic tomatoey flavor, even though you shouldn’t sub one for the other. Do as I say, not as I do. There’s one word attached to the chickpeas: “rinsed.” You might think that this is an optional step, but it really isn’t. If you look inside the can, you’ll see a suspiciously yellow liquid that looks nasty. You don’t need a strainer or a colander; I find that using the lid of the can works perfectly fine. Or, if you don’t want to deal with rinsing your canned beans of that weird liquid, you can also cook your own beans (which is not so arguably more time and energy intensive). I didn’t wipe out the Magic Bullet before pureeing part of my sauce. Why should I? Everything gets mixed up anyways, so I think it’s perfectly fine. At the end, I stirred in some chopped olives, since olives make everything better. I used penne, but I think ditalini would work better, since the sauce to pasta ratio is then spot on. I loved the leftover sauce with a little mound of brown rice, so you could definitely serve it over rice or quinoa or freekeh or another grain. The sauce was pretty good. I loved the olives in there, especially since I underseasoned. The vegetables didn’t come through as much as I wish they had, but it wasn’t a huge issue. The chickpeas were tender yet toothsome, a nice counterpoint against the softness of the sauce (if that makes any sense). I was extremely grateful for the fact that there was no lingering hint of burnt crap, only vegetable goodness. I loved the addition of the garlic rosemary oil; however, I couldn’t justify the use of another pot for this. I think rosemary and extra garlic in the sauce at the end would add the same zing with less fat, less dishes and less time. I think some Parmigiano would add a nutty, rich quality to add in more creaminess if you don’t make the oil. This is a very time intensive recipe. It took me two and a half hours; however, this including the time taken to correct the burnt issue, and the fact that I was procrastinating which may have slowed me down a bit. If you aren’t doing the dishes, make this; if you are doing the dishes, you’re going to want to find a one or two pot dish, as this one easily used three. Heat 1/4 cup oil in a large pot over medium heat. Add the vegetables, garlic, parsley and red pepper flakes. Season with salt and cook, stirring often, until golden, 8-10 minutes. Stir tomato paste/ketchup and 1 cup water together; add to pot. Deglaze. Bring to a boil, reduce heat, and simmer until liquid has almost evaporated, 5-8 minutes. Add chickpeas and 2 cups water and simmer for 15 minutes. Stir in the olives. Purée 1 cup in a food processor until smooth, then stir back into sauce. Stir in 2 cloves garlic and the rosemary. Divide pasta into bowls. Top with the sauce and shaved Parmigiano-Reggiano.